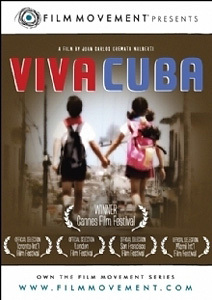 Viva Cuba (Director: Juan Carlos Cremata Malberti, Cuba, 2005): Viva Cuba is a charming fairytale/road movie that submerges its political message in a very personal story of friendship and love. Jorgito and his tomboy friend Malu are on the cusp of adolescence, and their close friendship seems about to morph into something at once more serious and more frightening. It’s evident from the way they can be holding hands one minute and arguing violently the next. To make things worse, their families detest each other. Malu lives with her mother, a bitter woman whose family used to wield influence in the days before Castro’s revolution. Jorgito’s parents have moved to Havana from the countryside and are firm supporters of the government. Each mother admonishes her child for playing with an unsuitable playmate, but that only drives the pair closer together. This Romeo and Juliet story really takes off when Malu’s mother decides to leave Cuba forever, to join her boyfriend in what we assume is America. In order to get permission to leave the country with Malu, she must get her estranged ex-husband to sign an exit authorization. Knowing this, Malu and Jorgito hatch a plan to appeal to his paternal love (or guilt) by traveling in person to see him. The problem is that Malu hasn’t seen her father since she was six, because he works as a lighthouse keeper at the other end of the country. The two young protagonists hit the road by train, bus, and oxcart to reach their destination, but their constant squabbling threatens to ruin the plan. In the meantime, their worried families have seemingly reconciled in the desperate search for their missing children. First and foremost, this is a beautifully-shot film, and the use of colour is often striking. The political message, such as it is, seems to ignore Castro completely; instead, it’s a shamelessly pro-Cuba film, highlighting both the island’s natural beauty as well as the fierce pride of its people in their cultural institutions. It’s not surprising that music plays a big part in the film. It’s unclear whether the director was attempting to make a film aimed solely at children. There is certainly a sense of naïveté in the dialogue and the basic structure of the film, and there is never any real danger to these two kids on the run, but the ending seemed particularly grown-up and ambiguous, and made me reevaluate my initial impressions. Some critics have seen the film as an allegory depicting two sides to modern Cuban culture, but I don’t believe the intention was that obvious. I think the film gains resonance from refusing to be overt about its political opinions. Instead, it leaves the viewer to untangle his sympathies from the intersection of conflicting desires in a country that is changing, just not fast enough for some. Note: Film Movement featured this film as their Year 5 Film 5. This entry was posted in DVD, DVD Clubs, Film Movement and tagged adolescence, children, cuba, DVD, DVD Clubs, Film Movement, road-movie. Bookmark the permalink. I saw this movie in a Cuban theater last year. At first, I did not understand it as it seemed completely unlike anything which could actually happen in Cuba. It is inconceivable to me that a couple of children could run away from home in Cuba, get completely across the country, hitching rides and so forth, without being found out. In the movie, one of the characters is one of the island’s best-known broadcast news readers, Mariushka Diaz and while anyone from the United States could easily understand and identify with news reports of children running away and no one able to find them, such a thing is inconceivable in Cuba. On reflection, however, I realized that this movie had a great deal to say to all sorts of people, both inside and outside of Cuba, because it deals with a phenomenon very profound for so many people, the choice by so many people – sometimes thought about over and over and over – as to should they stay in Cuba or should they leave, and for what reason the individual should make such a choice. Cuban films are filled with this kind of conflicts, which so many Cubans themselves can identify with. My father and his parents used to live in Cuba, and I travel there often. Thanks for your comments, and for this blog, too! Walter, thanks for your insightful comment. There is definitely an element of “unreality” to the film, and even the use of some animation (in the “shooting stars” sequence) alerts us that this is not a strictly true story, but more of a fable or fairytale.